Use a generic enough helmet that no obvious implausibilities arise. 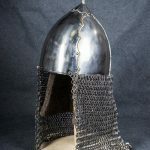 Use a helmet after finds from Gnezdowo or Cernigov, because with all the Eastern finds in Birka, it’s very plausible that the Garrison guards and other military personnell on the island would use this type of helmet. 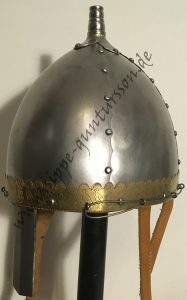 For the first year or so of doing Viking stuff, I had a self-made spectacle helmet which even survived the first Neustadt-Glewe – but I had to hammer out dents twice a day. I decided to switch helmets. For a long time, I opted for choice one. I used a generic „Olmütz“ type of nasal helmet for fighting. I had two of those helmets – one with a mail aventail that covered the face, and under that aventail a steel plate was riveted into the helmet, to avoid face shots. I ended up not using that helmet a lot, and kept fighting in my aventail-less nasal helmet. It was lighter, more maneuverable and held up even to the worst beating in Wolin and Neustadt-Glewe. 3. 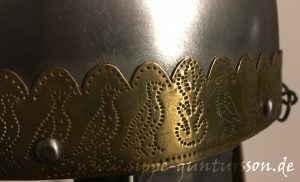 Create a reconstruction of a helmet that could have been worn in Birka, based on the existing evidence. There are three types of mounts that were found in Birka’s Garrison. These are copper-alloy sheet metal remains, gilded and decorated by punched bird images. The fragments are curved slightly inwards, as if attached to a curved surface The birds are grouped along various tree-of-life drawings. Two fragments were found. „aventail holder“ possible helmet mount from Birka. Picture from SHM database. 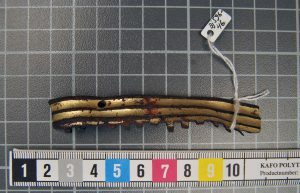 This is a gilt copper-alloy mount that has two ridges, and the remains of what could have been hooks on its bottom. The hooks could have held a wire and the wire, in turn, could have held a chain mail aventail. „Helmet tip“ mount, Image from SHM database. 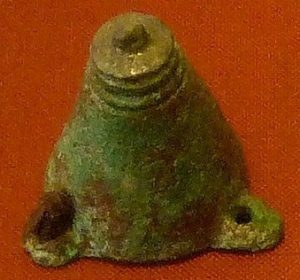 This mount is conical, copper-alloy and about 2.2cm high. That’s quite tiny. It was riveted to another item with iron rivets. Remains of tin show that the mount was previously tinned. There is a strong, well-documented Eastern connection in Birka. Magyar bow accessoires, lamellar plates from Steppe Nomads, belt decoration that’s similar to Nomad status symbols – Birka was a trading hub and might well have had Eastern soldiers in its Garrison. The influence of Western, or contemporary Swedish armour is also strong, with chain mail remains, and typically scandinavian sword types found in Birka. However, the volume of military finds with an Eastern connection is baffling. Therefore, it seems plausible that helmets in the „Eastern“ style (not to be confused with the Eastern style of fighting) were known in Birka. 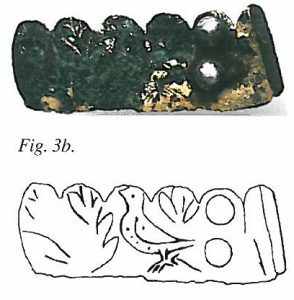 The finds from Russia vary from „highly decorated“ to „rather plain“, and while the decorated types, like Gnezdowo Type 2, or Cernigov, are very nice to look at, their decoration is not very similar to the „bird mounts“. Therefore, a simpler option should be found. 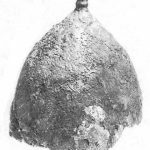 In the Eastern sphere of influence – roughly from the Kievan Rus to the land of the Magyars – there are several helmet finds which could be a basis for a reconstruction of a helmet from Birka. The most famous is the helmet from Gnezdowo, actually the „type 2“ helmet. There’s also a helmet type 1, which is of a different design. The image to the right is of famous craftman Thorkil’s reconstruction – the original was so battered and flattened that not many details can be seen. This helmet is „type IIa“ in Kirpichnikov’s typology. This helmet is a „type II“ helmet, and was found in Cernigov’s famous „Chernaia Mogila“, the „Black grave“, along another, possibly identical but unpublished helmet. The construction of all „Type II“ helmets is identical: Four plates are riveted to each other, and the front and back plates cover the side plates. The helmet plates don’t have straight edges, but a „wavy“ edgeline. The helmet from Cernigov has several decorations that distinguish it from simpler helmets. It has copper decoration on the front (looks a bit like flames), and square „thorns“ on the sides that look a little like the ventilation holes in WW1 German Steel helmets. Like every other „type II“ helmet“, this helmet has a hollow tip – possibly for inserting feathers as decoration. The Gul’Bishe helmet from the Cernigov area has the same construction, but less decoration than the CM helmet. It has a copper-alloy front plate (possibly semi-circular, like the later Nemia helmet, which is of course not of the Chernaja Mogila type), and it used to have an aventail, attached by iron loops protruding from the lower rim of the helmet. Also, it had the same hollow tip as all the other helmets. The helmet from Pécs in Hungary has a very similar design to the others, but an interesting detail. Instead of just riveting the steel plates onto each other, a decorative, dot-punched brass plate with the same wavy edges is inserted between them, giving a nice look. The image to the right shows a reconstruction by Nutevk Armory. I asked Miriam, my partner in crime (and mother to my two wonderful kids) to make a reconstructive drawing for this helmet – and this was the first draft. The base of the helmet mimics the metal plates from (amongst others) a helmet from the Chernaia Mogila kurgan in Cernigov area, but lacks its decoration. A simple steel nasal is attached. I need a nasal to protect my nose, and friends who ordered Cernigov helmets without nasals have regretted that decision. This reconstruction attempt combines all the three different finds into one helmet. I discussed this with Tomas from Project Forlog and he pointed out that the „helmet tip“ most likely was none, as parallel finds exist from other places without a helmet context. Maybe shield decoration, maybe something completely different. Also, we agreed that combining the „aventail holder“ fragment and the „bird decoration“ fragment was not such a good idea since they were found in the same building, but far apart. Therefore, they probably belonged to different helmets. 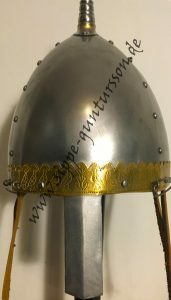 I wanted to have this helmet made by an armourer and found a very knowledgeable craftsman who I started discussing with. He suggested that instead of the Charnaja Mogila kurgan, we might use the helmet remains from Gul’bishe. The „helmet tip“ mount from Birka has one constructive detail that makes it questionable as a helmet mount: Its base is flat. Were it a helmet tip, the three rivet tongues would have to follow the helmet’s form (like you can see in the reconstructive sketch), and it doesn’t. Due to this uncertainty, we decided to forgo this helmet tip and stick with the original, hollow helmet tip from the Gul’Bishe helmet. This helmet tip is almost identical across all „type II“ four-panel helmets, so it’s the safest bet. There are a couple of documented finds that show us the construction of aventail holders for helmets. Beginning with Gjermundbu, and extending over different methods of attachment, there is a very good article by Tomas (in Czech) here: Další fragment přilby z Birky? The „aventail holder“ mount was disregarded (due to it being from another item, likely), so we went for a method of attaching the aventail that is documented at least for the Pécs, the Gul’Bishe and the „Kazazowo“ helmet (of which I can’t find any documentation apart from some pictures on pinterest and on a helmet maker’s site). This method consists of wire loops riveted to the helmet rim, and a wire that is fed through them. The aventail is then looped onto the wire, and can easily be removed, should the need arise. I need a nasal. I hate having faceshots that go for my nose, or even teeth, and more than once had my nasal protect me of such shots. With my clavicle broken in Wolin last year, I don’t need any additional risk, even if it’s only a perceived risk. That being said, there is scarce evidence of nasals for „Type II“ helmets. Most, if not all, were originally without a nasal, and in some cases (again, Kazazowo), they might have been riveted on later. Therefore, we fantasized about a nasal, and decided to attach a simple one (which is welded to the lower rim of the helmet, but the weld is covered by the brass decoration). The rounded nasal in the reconstruction sketch was replaced with a more edged nasal, in line with the overall design of the helmet. It’s a bit too long (maybe 2cm), but better that than too short. This nasal is purely conjectural and a concession to my fighting style! The order was finalized, and the waiting began. After a really small while, tracking information arrived, and finally I was asked to come to the nearest Customs office to pick up my parcel. Customs in Germany are as much hassle as anywhere else, and have made a habit of very thoroughly checking freight papers and invoices, even for small private parcels. I really have to say that Nutevk Armory did a great job overall – the turnaround time was really good, the handling very professional and Janos went out of his way to achieve a design that suited me and was historically correct – at least as correct as possible, given my requirements. This is the finished reconstruction attempt. It is speculative, but I think I have outlined my reasoning above, and the speculation is well-founded. Due to the off-season and the fact that my clavicle is still not healed, the helmet hasn’t seen combat yet. It will, though. Soon enough. Birka helmet seen from the left – note the wire for aventail. Birka helmet seen from the front. 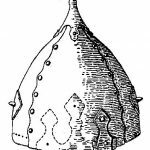 The helmet reconstruction that I showed you above is based on the Gul’bishe helmet from Cernigov area, and finds from Birka’s Garrison. The nasal is added for protection, it’s purely speculative. 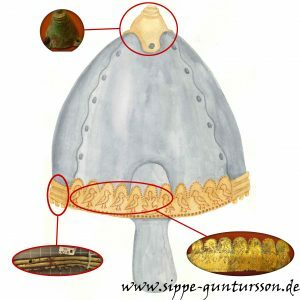 Dieser Eintrag wurde veröffentlicht in Bewaffnung und Rüstung und verschlagwortet mit bird, Birka, copper alloy, Eastern helmet, garrison, helmet, helmet decoration, Wolin von arnulf. Permanenter Link zum Eintrag. what about a second pic with your interpretation of wearing a belt? I’m not sure if you commented in the right article, but here goes anyway. There’s a longish German article about my interpretation of the two-ended belt from Bj716 in the blog, and apart from that I only have another „warrior belt“ (based on finds from the Garrison). These are a little different to normal belts because for these warrior belts, there’s proof that the „dangling ends“ were a thing (status symbol for initiated warriors, imported to Birka from the Steppe cultures, see Birka II). When I make a „civilian“ belt, I will update the blog post.